Well, I'm addicted to methamphetamine. I've been in recovery for one year, 3 months, and 11 days. When I was released from jail one year ago, I decided to read Tweak. An old friend of mine read it while he was in juvie, that's how I first heard about it. Tweak was relatable to me, and so was We All Fall Down. Nic Sheff is an amazing person, he had overcome a lot. He inspires me. So when I found out that his father also wrote a book about his son's addiction, I just had to have it. Let me tell you, Beautiful Boy tore me apart. I've only experienced life from the point of view of someone on meth. I thought I was being considerate, I always checked in with my family on a weekly basis. I was home at least twice a week. I worked full time, but still liked to go crazy with my friends. After reading this book (okay, while reading it) I cried and apologized to my parents, my grandparents, and my uncle for all the hell I had put them through. I honestly had no clue that I was hurting people so badly. If you're an addict, if you have a child that is an addict, even if you're neither, READ THIS BOOK. This was an amazing, touching book told from the other side of addiction - a side not heard very often - the side of a parent watching their child slowly spiral out of control due to addiction. As a recovering addict myself, (13 yrs., 11 mos., 11 days), as well as a parent, it was really hard for me to read at times but I'm SO glad I did. This is an amazingly touching book that is at times funny, emotional, heart wrenching, and hopeful. I would recommend this to book to everyone but especially to those struggling with either side of addiction. It took me over 2 weeks to read this amazing book and I'm normally a 1-2 day per book person. Why? Because my own pain walking in David's shoes was so intense that I had to step away and could only take it in small doses. This has been our life for 20 years and I know there are specifics David didn't share/ couldn't share because it is so horrifying to know the reality of everything your child is doing to obtain these drugs of choice. It was comforting in some strange way to be inside David's head and know that I'm not alone in thinking these things and more. It is also appalling that in this great country - which gives away everywhere - that it is so incredibly difficult to find help and rehabs for those with mental health issues or addictions. The daily battle is overwhelming. There should not be such a battle/war to find reputable, effective programs for help. 28 day programs - a load of crap. Nothing of true, long lasting value can be accomplished in 28 day programs. I still remember sitting in our first family session at a program - 20 years ago. Sitting in that circle that would become yet another dreaded part of this process and listening to people talk about it being their 4th, 5th, 6th time. Thinking there is no way possible OUR child, OUR family would ever be back here doing this again. We were a good family, had raised great kids and we would handle this and fix it during this one go round. I lost track of the rehabs, the programs, the jails, the prisons a long, long time ago. I also learned a lot along the way about the impacts of things birth parents did to impact a beautiful girls destiny. Not to absolve our own part of this - all parents make mistakes along the way. But just because you received the gift of this child while they were young - it doesn't remove damage done in the womb and even as a small infant. And that terrifies me for the two beautiful baby boys that my child had and gave up to some other loving family. I worry about the predisposition to addiction those beautiful boys have been sentenced to. You learn....constantly and painfully. David captures this in his amazing book. I am debating with myself now about sharing it with my daughter so perhaps she can finally see inside our minds and hearts and understand the depths of the fear, the anger, the pain, the destruction. I want to believe that might help her/us heal if she could ever understand this isn't all about her and her pain. God help me but it does come to a place where you are glad they are locked up somewhere because at least they are safe and for a little while you can sleep....you aren't waiting for a dreaded call to come with horrid news.....or waiting for calls to come just to know they are alive. You do truly begin to dread and hate a ringing phone. Enough already. This is a true must read for any family or person that knows and loves an addict. It would be a good read for those that don't - just for their understanding and education about how this plague of addiction affects people they interact with every day and yet may not even know the hell they are living. Thank you for writing this David. I felt like I was holding my breath throughout waiting to know that Nic was still alive and was making it. I'll be reading Nic's own story next. This memoir should be required reading for families, friends, educators - anyone who might be touched by another person's addiction to drugs or alcohol. David Sheff doesn't mince words nor does he try to hide behind as he recounts his family's struggles to help son Nic battle a methamphetamine addiction. Sheff writes with honesty as he experiences a full range of emotions - sadness, happiness, guilt, hope, grief - you know it and he has experienced it. Not only are emotions laid bare, but so are the facts about meth addiction, the search for treatment and the truth about long-term damages and effects. The author has interviewed many, many experts and researchers in his quest to understand what drives a person to addiction, what chances there are for a recovery and what needs to be done to get a handle on this epidemic. And epidemic it is. Opioids are in the headlines these days, but meth is drug that keeps on killing. It changes the user's brain, body and soul. Sheff has seen first-hand what the drug has done to his son, and his story is one that way too many families are experiencing, too. The memoir is being made into a movie, but I urge readers to experience this story in its truest form - the written word - before seeing the movie. 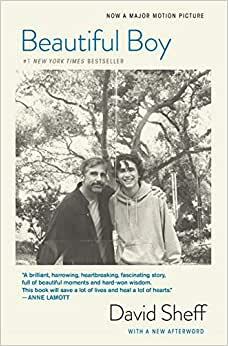 As a companion read, check out Nic Sheff's memoir of his addiction. I haven't read it yet, but it's next on my list.